This review originally ran in the Tuesday, June 26 of Shelf Awareness for Readers. If you don't already subscribe, sign up here to receive a bi-weekly dose of readerly goodness in your inbox. Seth Grahame-Smith has made a name for himself with delightful re-imaginings of well-known stories and histories, including Pride and Prejudice and Zombies and Abraham Lincoln: Vampire Hunter. Unholy Night continues this trend, tackling the story of Christmas and the three kings who journeyed to visit a small babe lying in a manger. Or, rather, of the three escaped criminals disguised as noblemen who try to hide out in a manger that also happens to house Mary, Joseph and the recently born baby Jesus. Grahame-Smith approaches the story through the perspective of one of the three visiting kings, Balthazar--a professional thief famous across the Roman Empire for his masterful deceits. When Balthazar escapes execution, with two other criminals in tow, he finds himself on the journey of a lifetime, in the company of a carpenter, a woman and a babe--with the entire Roman army on his heels. His fight to protect his travelling band is complicated by his agnostic views, his lack of religion and his tortured past. Peter Berkrot's (77 Shadow Street) narration brings Grahame-Smith's already rich characters to life, from the spunky, opinionated Mary to the spiteful, bitter Balthazar, and though the three "kings" do not, in fact, smoke a rubber cigar, they do have their fare share of humorous exchanges, adventures and full-out battles. 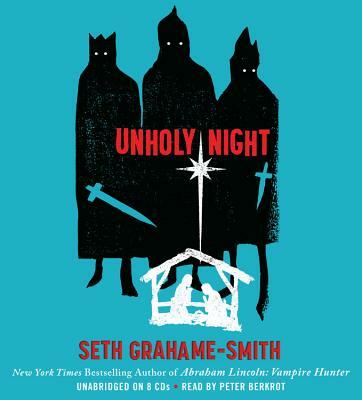 Unholy Night is an entertaining retelling of one of the most familiar stories in Western civilization. Bizarre, I am listening to this right now as I go through my reader. Audiobooks are tough for me though and I may end up having the get the paper/ebook version. I like audiobooks, especially for long, solo trips in the car. I'll put this on my reading, I mean listening, list.